Swedish startup Spotify launched its online music streaming service in public beta a few months ago, looking to compete with established music sites like Last.fm. Offering either subscription or ad supported version of its service, Spotify offers the artist and related tracks radio that is a feature of Last.fm, but has also provided a good range of tracks that can be listened to on-demand. It has been touted as an ‘iTunes Killer’ by some, but this is misleading as, despite the iTunes-style interface, it doesn’t offer tracks for sale through the site yet, allow users to upload their own music, or download to iPods and other MP3 players. 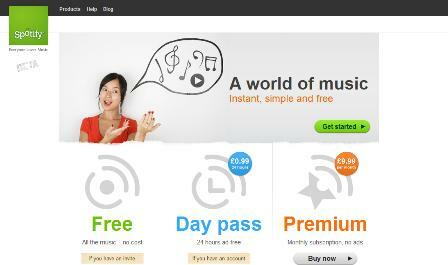 The obvious competitors are services such as Last.fm and Pandora, or Deezer, which offers a similar on-demand option. Using Spotify requires the download of a desktop app, but this took no time at all. The desktop app resembles the iTunes layout, and has some similar features, such as the ability to drag and drop to create playlists. To get started, you can select a radio station from a selection of musical genres and decades, or simply search for an artist or song title. The search works well, and results are returned quickly, though it could do with the option of searching by either song, album or artists to make it more accurate. For instance, searching for ‘The Fall’ returns lots of songs with the word ‘fall’ in the title, not tracks from Mark E Smith’s band. Once you get the results, it does display some suggested artists and albums liked to the search term. The artist pages are a useful resource, offering the chance to scroll through the available songs and even listen to entire albums if you want. The artist radio offers a similar service to that provided by Last.fm, by playing songs by that band and tracks by similar or related artists. It also tells you the other bands that will appear on that radio station, a useful feature. Spotify has deals with the four major labels, as well as a number of independents, which explains the wide variety of music on offer, though publishing rights issues forced the removal of some songs from the service recently. I have been using the free version of the service, though there are premium versions available at around £1 per day or £10 per month. This is expensive compared to Last.fm, which charges about £1.50 per month, but the option of accessing such a good range of music on-demand is appealing, and if there is enough on there that you like, then it may be worthwhile. The premium version gives you the ability to invite more of your friends to use the service, improves the search options so you can specify artist / title/year etc in your search, and removes the advertising. On the free version, you need to listen to an advert of roughly around 30 seconds for every half hour of music you play. This can be a little intrusive, but it still beats the radio. While it has some features in common with Last.fm, such as the ability to discover music by listening to artist radio, it doesn’t use your playing habits to provide recommendations, or offer the social network features. With the ad-supported on-demand model, it has more in common with French streaming site Deezer, and provides a better user experience than this rival. Spotify is still in beta, so you need an invite to use the free service at the moment (thanks to rberrios for my invite), though you can choose to pay for the service. It’s an excellent service though, and well worth a try, though an iPhone app to use Spotify on the move would be a good idea. LinkedIn’s traffic grows rapidly but is its value dropping? With the global economy still in a tailspin and waves of layoffs still hitting major industries, it’s no surprise that websites catering to professionals and job-seekers are increasingly popular. After all, business and jobs become far more important when business is harder to build and jobs are harder to come by. As Microsoft pushes forward on the path towards Windows 7, the successor OS to a very disappointing Windows Vista, the Redmond-based software company has made an Internet Explorer 8 release candidate available for download. IE8 will come bundled with Windows 7 and represents Microsoft’s effort to maintain IE’s always-vulnerable but still-dominant hold on the browser market. With Encyclopedia Britannica gearing up to launch a new version of Britannica.com that will incorporate more community features, I decided it was a good time to take a look at Britannica.com. Is it in a good position to compete with Wikipedia, the user-generated online ‘encyclopedia‘ that eclipses Britannica.com in popularity, or will it have to do more? Here are 5 criticisms of Britannica.com that I believe it needs to address to be successful.